This is an easy to follow step by step tutorial on how to create your own DIY Sandbox. This project has been in the works for months, actually more like since last Spring when Riley’s Grandma and Grandpa bought her a Lil’ Tikes Playground. Joe decided he was going to take out our herb garden that was at the end of our patio and put the playground there. Don’t worry though I didn’t lose my fresh herbs for my recipes. My Canvas Shoe Planter worked perfect for our space to continue to grow my herbs. You go girl! It looks amazing! I have personally used the sheet method myself 😉 Where's a wheelbarrow when you need one right? Have a fabulous weekend! Oh my word, this looks wonderful! I am laughing at the picture of you using a sheet, I have done the same thing 🙂 Thanks so much for sharing. We have a sandbox in our backyard that has been going strong for 9 years now. Kids love sandboxes. Enjoy!!! Amazing Sandbox! My son would love it! Wow! My son would love this! Bookmarking this for the hubby to have a look at! 🙂 Thanks for sharing on the All Year Round Blog Carnival. This looks great! I found you through Famiglia & Seoul. I've been trying to get hubby to build a sandbox. I will have to show him this. Following you now! That looks GREAT! And so does the steak recipe! Enjoy your weekend! WOW!! I'm impressed :o) I bet yall are LOVING that sand box. I'm your newest follower via the blog hop and am so happy to find you. Your kids will have a blast with their new sand box. I always loved sandboxes when my kiddos were little. You did a terrific job (and all without a wheel barrel)Just visiting from the Blog Hop and still enjoying following you. I would so love if you would share any of your awesome posts at Freedom Fridays. Hoping to see you there. Wow what a beautiful sandbox! I cannot believe it took 35 bags of sand wow! My hubby just finished up our DIY Sensory Bins and the kids have been loving them! Hope you have a wonderful week! really neat, I may try as well! And thanks for the comments on my blog and for following too! What a lot of work…but great results. Looks like a lot of fun! This looks great! My daughter loves her sandbox. I'd give every kid a sandbox if I could because they get so creative in them. I'd love for you to link this up to Titus 2 Tuesday tomorrow on Cornerstone Confessions. Stopping over from Serendipity and Spice. What a lucky gal! I want a sand box for my boys, but was thinking of going easy with the large turtle from Wally World. Thanks for linking up with us this week! I have one of the turtle sand boxes for my grandchildren and while it is nice, it is small and if rained in, it takes forever to dry. I like this idea but would have to make some kind of a cover to keep the rain out. Wow…you did a great job! I bet your kiddos love it! That's awesome, my little boy LOVES to play in the sand! I would love for you to share this (and any other creations) at Pin It and Win It Wednesday @ http://www.cheapcraftymama.com– where you can win free ad-space on my blog! Such fun! Thanks for sharing at our Handmade Tuesdays party. I love how easy that looks! I am thinking that a sanbox is just what my kids need this summer! What a fun place for Riley to play! Great job! My kids would love a sand box. Thanks for sharing at Terrific Tuesdays. Wow, what a great project!! Thank you for sharing them at Sharing Saturday!! I hope you are having a wonderful week!! Wow! So much fun for the kids! They must love having that in their own yard! This looks like so much fun! My son would love it! Do you have to wash the sand every now and then or just let it go? I've always been curious to know! 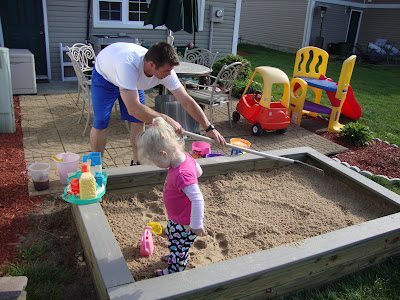 Awesome sandbox… Have pinned it and hopefully the hubby and I can make something like this this summer 🙂 Thanks for sharing at Sharing Saturday. we had this sandbox for 20 fun faithful years….got so much enjoyment watching our kids ..you will too!!! This makes me want my own sandbox! Thanks so much for sharing on Tout It Tuesday. Great job! I bet that has been played in so much! We're building a sandbox this weekend so it was great to see how you did yours! Every kid needs a sandbox and looks like she was havin fun helping with the construction. Your little girl is going up and is s cute in her ponytail! I just bought my 6 month old a basket of sandbox toys…it'll be awhile before she'll be able to use them but they are so much fun! Wishing you a wonderful weekend! This is one of my top picks for the week too!! I totally want to do this! Right now we just have a “mud area”! I have 3 boys and 2 girls though, and the size I would need to keep the dirt/mud container would be mammoth….still thinking about my options. Love yours! Such a great idea. I would love if you shared it on my linky party! The sandbox turned out great! I can't believe how many bags it took to fill it. I'm sure your daughter will have so much fun in it. Thanks for sharing at Showcase Your Talent Thursday! You are the coolest mom! Love, love, love this! Thank you for sharing this project at our Summer BBQ Bash! Stop by tomorrow if you have a chance — I'll be featuring this project! I just want to tell you that I’m newbie to weblog and seriously liked you’re web page. More than likely I’m going to bookmark your site . You certainly come with really good posts. Regards for sharing your web site. Such a great idea! Maybe the hubby will make one for the grand babies! While I like the idea of a covered sandbox, especially the one that has benches that can each fold out to reveal the play area, yours is pretty nice, too. I just want to mention that weed fabric is quite thin and most people find two layers are significantly better than one. I hope she doesn’t try to dig through it at some point. The other point I wanted to make is that sand can be bought in bulk and is probably preferable than the cost of so very many small bags. (This assumes a wheelbarrow and a truck (or delivery fee), though.) How much was your total cost for materials? What type of sand did you use? It looks more clay-based than the sand in which I grew up playing. Thanks for sharing your project. Trackback from Great Ideas -- 20 Spring Home DIY Projects!